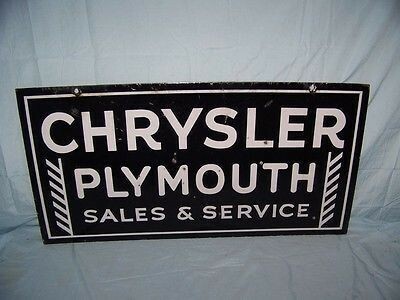 Measuring 35″ by 18″, this Chrysler Plymouth Sales & Service sign is navy blue with some interesting details to the sides. The details to the side are lines with diagonal lines facing downward. This sign is nice and clean, and it would be a good addition to any collection.